Concrete Paver Patterns | Paver Patterns - Tile Tech Inc. The designers typically select the concrete paver patterns that they can readily harmonize with the rest of the area. You can combine two paver colors to help you provide an interesting detail for large areas. The pavers also come with the blended colors if you want to play around with the design some more. The concrete paver patterns are highly similar to those that you can find in the brick and colored concrete products. In this regard, you may take note of variations in shades. The variations in shades may result from the slight discrepancies in the main materials used and the dye lots. You may install concrete pavers from numerous pallets at a time. You have to choose the concrete pavers with a lighter shade than the color of the brick that you will use for your home. Alternatively, you may use cobblestones. You have to repeat the shape of the design by utilizing the brick shaped pavers. This especially works best with the rectangular colonial styles. For the Victorian style feel, you should repeat the curves on the arches of the doors and windows by designing the curved edges. 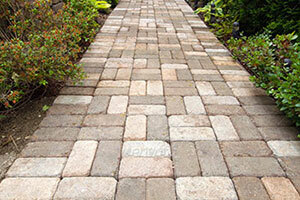 As much as possible, you need to refrain from using the straight and long rows of pavers. If you have to use these concrete paver patterns, you should lay out the edge of the concrete pavers parallel to your pathway. You should also use the basket weave pattern for the interior. Including a header course towards the same direction or using a paver with a different color can help you create interesting patterns around the pavement. The curves can help you add grace and interest for the entire theme of the surface. However, this will require you to invest in more cutting and extra labor. When you are using the concrete paver patterns, you should work on the attention or emphasis by creating different kinds of laying styles. Laying the concrete pavers using a 45 degree angle with respect to the lines of the house will help you draw the general attention to that spot. The angle makes the space appear smaller than when the pattern is laid using a 90 degree angle. 1.Overall formality of the design. When choosing a paver pattern, keep in mind the emphasis or attention created by certain types of laying styles. The general rule of thumb is that laying pavers or tiles at a 45 degree angle to the lines of your house will draw attention to the area. This angle also has the effect of making the space look smaller than if is it was laid at 90 degree angles to the line of your home. Every time a paver has to be cut, the laying costs will increase dramatically both for the time involved and the wastage of materials. In small areas, use simple pavers patterns, like the running bond. In large areas, you can break up the expanse with a variety of patterns or dividing bands. Curves add interest and grace to the overall design – but also loads of cutting and extra work. The inclusion of a header course in the same or different-colored paver can also be incorporated with all the patterns shown to create a feature around the pavement. The 45 degree herringbone pattern is becoming increasingly popular in feature outdoor living space as the pattern works well with stand-out borders and edging. It is a busy pattern to choose so it will definitely be noticed. Whereas straight or 90 degree herringbone has the ability to blend into existing paving and have a natural flow to other sections of the house. This side-by-side style of paving is the plainest of all paving patterns, but it has the illusional effect of seeming narrower or wider depending on the direction in which it is laid. Stretcher Bond is good if you want to make a path look longer. If you position the pavers so that their length runs along the length of the path it will look longer. On the other hand if you want a path to look wider in a Stretch Bond pattern, lay them perpendicular to the length of the path. Stretcher bond patterns are good for a less formal design where it is not desirable for the eye to be strongly led. The pavers tend to look more rectangular and it is also the best pattern for coping with gentle curves. Again, choosing the right paver pattern size will minimize cutting but wastage will still be higher – at least 7%. Basket Weave is best suited to old world English landscaping themes. This style of paving can be effective if you are using recycled or old pavers as it brings out the rustic charm of cracked old textures. A regular grid pattern looks great in formal designs and will have the least wastage (as low as 5%) as long as the designer has had the good senseto create paths and spaces sized in multiples of the selected paver’s width. A one meter wide path is hardly commonsense for a 400mm x 400mm paver. Diamond paver patterns can look great but will require a great deal of skill and experience on the part of the contractor – many may just not be interested in the job. Wastage increases substantially at 12% and up.